I know. I've been remiss in not posting more frequently. It's just been incredibly busy ever since I got back from Tokyo and while jet-lag was never an issue - a trip of that distance and quality somehow throws you off stride. But I'll keep trying. Hands down the best show I've seen so far (outside of my own gallery) is the Lartigue show at the Howard Greenberg Gallery. Primarily composed of prints from the 1950s and 1960s, it captures the zest for life and movement that was Lartigue's great talent. There's a good selection of the iconic images, but also some new discoveries like the photograph above. Here are a few more (below) but if you're anywhere near New York you must catch the full show. As usual, Kate Moss is always around somewhere. And with my new iPhone, which certainly takes better pictures than the original model, I'm free to snap away at whatever catches my eye. Heading into Crozier Art Storage a few days ago, here was their newly decorated truck. Those are Corinne Day's recent pictures of Kate commissioned by England's National Portrait Gallery. A few blocks away on 22nd St.and all around the Chelsea/Meatpacking District - you'll see the work of this anonymous street artist/collagist. It's as good as anything in the galleries. And here, again on 22nd Street is Anna Wintour. If you haven't seen "The September Issue" don't wait another minute. I found it both fascinating and incredibly well made. And not a dull moment. Have you noticed how every other cab in New York is advertising strip clubs? I always wonder what a tourist to New York thinks. It's not as if this is what the city is known for. I guess the girl in the first two pictures below is doing double duty. So maybe the message is that if you work really hard in New York you'll succeed. Perhaps we need to inaugurate another blog search (as we did with Mannie Garcia) to find out who this hard worker is! Is this a stock photo that might pop up in ads in other cities or is she one of New York's finest? And one last apology - or rather a warning. Edward Mapplethorpe e-mailed me recently to tell me that he was trying to show a client my blog, and while sitting at the computer with them he went to theyearinpictures.com - only to find the most pornographic site imaginable! He was duly embarassed. When I started this blog, I remember checking the .com URL and it wasn't available, but it certainly wasn't anything X-rated. So please send your friends to theyearinpictures.net or the slightly less memorable pictureyear.blogspot.com. Robert Frank. Elevator - Miami Beach, 1955. One of photographer Robert Frank's most famous images aroused a particular interest from his friend, beat writer Jack Kerouac. 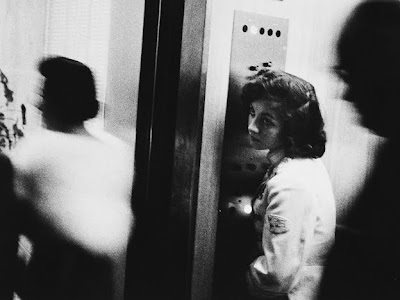 In his introduction to Frank's book of photos The Americans, Kerouac writes, "That little ole lonely elevator girl looking up sighing in an elevator full of blurred demons, what's her name & address?" "I stood in front of this particular photograph for probably a full five minutes," she says. "And then it dawned on me that the girl in the picture was me." The iconic shot shows a young girl, pressing an elevator button, looking up with an enigmatic expression. At the time, her name was Sharon Goldstein, and she lived in Miami Beach. At fifteen, she got a summer job as an elevator girl at the Sherry Frontenac Hotel. She says the hotel was always full of tourists, and many of them had cameras. Although she wishes she remembers this particular tourist, she doesn't. But she pieced together what happened by looking at Frank's contact sheet. 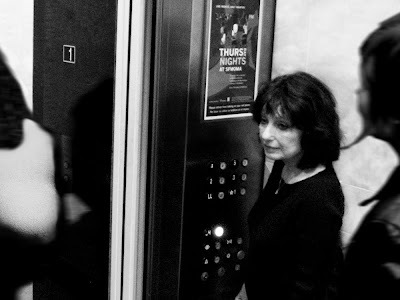 "Robert Frank took about four photos of me without a flash in the elevator. I didn't know he was taking them. And then when the elevator emptied he asked me to turn around and smile at the camera. So I flashed a smile, put my hands on my hips, and hammed it up for about eight or ten frames." From the single image that was chosen for The Americans, Kerouac guessed she was lonely. But Collins thinks otherwise. "It's not necessarily loneliness, it's ... dreaminess." Photo by Ian Padgham. 2009. We're back with a new weekend video, and to celebrate the beginning of a new art season this one is all about energy, and performance, and achieving your potential. A hipster grooving to his shadow at the opening night after-party. It seems silly to try make any sensible pronouncements after six days in a country, four of which were spent in an exhibition hall. Saying how wonderful the people were sounds condescending, especially as at the end of the day, they’re just like us only generally more polite. So I thought I’d sum up with a selection of superficial visual impressions, some taken on my iPhone and some on my Lumix. And now I’m getting ready to start my 13 week beginner’s Japanese course. (Seriously.) I can’t wait to go back. Tokyo streets are not marked by name (it’s a complicated system where a location is pinpointed by area) and so this guy was taking turns with his colleagues to hold a sign on Roppongi Street to guide people to the correct turn-off for the fair. A hotel room begins to seem like home after a few days. Here's the view from my window at the Grand Hyatt Hotel - the best hotel I've ever stayed in. The famous Shibuya crossing that seems right out of "Blade Runner". Sign at the Mori Museum. Two views of Tokyo from the Mori observation windows. Louise Bourgeois' spider statue outside the Mori Museum. Armani ads hover over the escalators going into the Roppongi subway station. Pens displayed at the Isetan department store. Everything for your desk at the Isetan men's department. The custom Leica display case at the Isetan men's department. A bedside light that shines a pinpoint of light so you don't disturb your partner. My one purchase for myself - fleece lined boat shoes made exclusively for the Japanese market by a Spanish shoe company. Some details from Ameida, a market round the corner from the exhibition hall where I would buy my lunch. Magazines with goodies inside at the airport. The Sartorialist, as popular as he is in America and Europe, is not much known in Japan - but as these pictures hopefully show, not only was his work much admired, but the stylish visitors to Photo Tokyo were only too happy to pose for me. My translator, Wakako Masudo, who is writing her graduate dissertation on Madonna. A man with rolled up pants. Shigeo Goto and Sawako Fukai from G/P Gallery. Kind of a Harajuku girl. A man with a black straw hat. A tall woman in shorts. A cool character with holes in his T shirt. This man's T shirt reads "Summer Madness" with a spider hanging off the "S". A Comme des Garcons type girl. A young man with black patent leather sandals. A young woman with elaborate shoes. A Japan Airline stewardess and her friend. The fair organizer, Tomo Harada.